Should You Choose Tungsten Wedding Bands? Learn Why!! 50% OFF! Should You Choose Tungsten Wedding Bands? We have found that tungsten wedding bands are the #1 choice for men! They are more popular than titanium and gold! A ring of marriage should be perfect forever after. A man’s wedding band should be a fitting symbol of his love and integrity. It should suit his lifestyle and personality. A band of marriage is an integral part of the wedding. The delivery and style of the marriage ring permanently etch an entire wedding in your memory. Unlike gold or platinum that is well suited for almost everyone, tungsten has a distinct personality. You may have worn jewelry before, and you may be confident about your sense of style. However, tungsten commands a new attention that will catch you by surprise. Before we proceed any further, let us figure out if a tungsten wedding bands are the right choice for you. What’s the right metal for your wedding ring? Tungsten is the pure metal found in nature. However, pure tungsten is not very suitable for making jewelry. Tungsten used to make jewelry is tungsten carbide. Therefore, while shopping makes sure that your jeweler has jewelry-grade tungsten that is robust and durable. Why is tungsten suitable for a man’s wedding ring? Weddings and wedding rings should last forever. Jewelers combine pure tungsten and carbon with a little amount of nickel or cobalt to make tungsten carbide. This is what we commonly refer to as “tungsten” in the jewelry world. The resulting metal is incredibly powerful. Some jewelers compare its strength to diamond. However, it is very easy to carve and stylize as per personal demands. This durable, low maintenance metal is currently one of the best choices for men’s wedding bands. Why should you opt for tungsten rather than other precious metals? Wedding rings need not be so expensive that it will cause you to sink into debt. However, that is a sad reality for many newlyweds who are still paying off installments for their engagement rings and wedding rings. Tungsten is cheap. It does not require frequent polishing. It offers a sleek and sophisticated look that gold or white gold can never achieve. Gold is less durable than tungsten. You may have seen quite some intricate patterns on gold rings and engravings. The jewelry designers have made sure that tungsten offers more scopes of innovative designs, patterns, and finishes. Engraving by hand is a little challenging since Tungsten is extremely hard. You can opt for a black tungsten finish with an understated brush finish, or you can choose a shiny silver sheen. None of these finishes compromises the durability of the metal. Another popular trend is to inlay the ring with carbon fiber. You can add attractive colors as per your personal choice. You can get black, gunmetal gray, white and even blue hues with the carbon fiber inlays. Another huge advantage of getting tungsten wedding rings is the neutral nature of the metal. We have seen people come back to get their gold and platinum wedding rings polished over time. Gold loses its luster; platinum forms blue platinum and even stainless steel rusts over time. However, tungsten carbide remains untainted for years even with regular use. Tungsten is ideal for you if you engage in daily activities that may involve brushing, scraping or knocking the ring on hard surfaces. Contrary to popular belief, tungsten bands are durable but you can end up breaking your ring by banging it against hard surfaces or dropping it on hard floors. This is more of an advantage in disguise. Since they are breakable, this allows people to break them open with vice grip pliers during emergencies. If you get a wrong size for your wedding ring, you may have to buy another one. Tungsten is not pliable. This means, unlike gold or silver, the jeweler cannot adjust the diameter of the ring. On the other hand, tungsten is cheap. Therefore, if you end up with a wrong ring size, you can only go ahead and buy another one before your wedding. What are the most popular tungsten wedding ring designs for men? Rings for men have always symbolized integrity, prosperity, and faith. This has been true for ages. While picking your wedding band or a wedding ring for a dear one, you should keep these in mind. Not only should the ring match the groom’s lifestyle, but it should also match his persona. There are quite a few traditional styles suitable for wedding bands made from tungsten. This is a little tricky to do on tungsten carbide; hence, this is also costlier than other options. It can add texture, drama and a touch of personal innovation to the rings. Adding models also add personality to tungsten rings. Most of the popular choices include Celtic and Kiwiana. This is more common for women’s wedding rings. You can choose precious and semiprecious stones for the marriage ring. Ruby is a typical choice for the sharp contrast if offers. The carbon fiber inlays are an attractive option for tungsten rings. They can convey different moods and different style statements on the same occasion. While some are somber white or jet-black, others can be bold purple or blue. Tungsten rings have been in the mainstream jewelry fashion scene since the late 2000s. It is wondrous how the trend of choosing tungsten over gold, silver, and platinum has persisted over the tides of time in the last couple of decades. Tungsten rings give enough options to suit all personalities and occasions. To get a better idea of available designs and sizes check out https://www.tungstenrings.com/. LEARN EVERYTHING THERE IS TO KNOW ABOUT TUNGSTEN WEDDING BANDS! Wedding rings are probably the most tangible symbol of love and eternal partnership in the world. The origins of weddings rings can be traced back almost 5000 years ago to ancient Egypt. While there are variations in the beliefs of different cultures, the ring and its broader significance remains the same. Some cultures believed that the hole in the middle of a wedding ring signifies a gateway into a new world; a new life. The ancient Romans believed in the existence of ‘Vena Amoris’ or ‘The Vein of Love’ which ran from the ring-finger directly to the heart. This is why the ring-finger was chosen to wear wedding rings. Wedding rings, in ancient times, were meant primarily for women. It was the most precious piece of their jewelry and displayed that they are already engaged or married to someone. As the modern society rose and the lines between then roles of men and women blurred, the wedding ring also started adorning the hands of men. A symbol of an eternal and undying bond which cannot be broken till ‘death do them apart’. When the rings signify something as strong, shouldn’t the ring themselves be strong enough to maintain their beauty and last that long? Among all the metals which can be used to make wedding rings, there is one which never loses its sheen, never gets scratched and never breaks – that metal is Tungsten. Mixed with other metals or even wood and adorned with precious gemstones, a tungsten ring is the modern science’s contribution to strengthening this symbol of love. They represent the new frontier of style, strength and sophistication. What Exactly Are Tungsten Wedding Bands Made Out Of? Tungsten rings are made by combining the metal Tungsten with Carbon, to form an alloy called Tungsten Carbide. The alloy is extremely hard due to its high density and has a melting point of 6,100 degree Fahrenheit, the highest among all metals. A hardness of over 9 on the Mohs scale make Tungsten Carbide four times as hard as Titanium and twice as hard as steel. The periodic table shows further information for anyone wanting to learn more. Widely used in industrial grade equipment, the alloy almost never gets scratched, retaining its shine and smooth finish for a very long time, making it ideal for wedding rings that last a life-time. Some Tungsten rings are a combination of Tungsten and Titanium, which further enhances their long-lasting characteristics and reduces their weight by about 20 per cent. These rings are then polished under diamond wheels to give them a luster which will last practically forever, making the ring look like it’s always new. Such type of an alloy is often also called Dura Tungsten. Tungsten Carbide rings are naturally grey in color. However, they can be given a high-grade color through the process of physical vapor deposition or PVD. This gives the ring a permanent luxurious deep black color which resembles the color of an onyx. The PVD process also gives the ring better resistance to wear and tear by reducing the friction on the surface. Black Tungsten rings are in high demand by consumers of both sexes and make for a highly attractive ring which looks like new even after considerable usage. A new type of binding process on the exterior surface of Tungsten rings can change the grey color to a rich white color. The glossy color looks similar to that of Platinum and, just like PVD, improves the resistant to wear properties. Though the white Tungsten bands are less prone to scratching than any other metal, the natural grey of Tungsten has proven to be even better. These kinds of options in tungsten wedding bands are making them very popular among young couples. They are an especially great option for those who wish to stand out and go for something a little different from the ordinary run of the mill wedding bands. What’s the Big Deal With Tungsten Wedding Bands Being Scratch Resistant? You may have heard a lot of talk about the scratch resistant properties of Tungsten rings. Some obvious questions that arise then are how true it is or how hard Tungsten rings really are? Maybe this will put things in perspective – Tungsten rings can be scratches only through extreme measures like rubbing against some of the hardest minerals found on the face of the earth, such as diamonds or corundum. Often people have to remove their wedding band while doing everyday chores or activities requiring heavy manual labor in order to protect them from getting damaged. This may lead to getting the ring misplaced or simply lead to a lot of inconvenience by constantly removing and putting the ring back on every time the person needs to work. The great thing about Tungsten wedding bands are that now you can work at your ease without having to worry about any wear and tear or any other damage to the ring. If you buy a stylish ring then you may get one with elements of other metals such as silver, platinum, palladium, rose gold, white gold, and yellow gold with the central Tungsten band. These give the Tungsten ring a more decorated appearance and even create a great contrast against the everlasting luster of the Tungsten as they wear out over time like usual rings. However, in such cases you need to keep in mind that while the Tungsten is scratch resistant, the other elements of the ring would behave like any other ring and will have to be taken care of. There are some events when the wedding band may need to be cut off or removed. Such incidents may include injuries or accidents. During such events the emergency often includes metals bending inwards out of shape to cut off the blood circulation in the person’s finger. While this is true for most metals, Tungsten may prove to be a life saver as it will never bend. Even when excessive force is applied, as in the case of impact during an accident, a Tungsten ring would shatter but not bend to cause more harm to the wearer. In case the ring needs to be cut off for some reason, you can rest assured that most emergency rooms are equipped with the right tools for the purpose and can safely remove it without more discomfort to the wearer. Tungsten rings can be shattered by applying significant force using vise-grip pliers, though one should visit a jeweler or the hospital instead of trying this themselves. Tungsten is also known as wolfram and has been made famous due to some of its quite amazing properties. As mentioned before, it has one of the highest melting points and tensile strengths among all metals. It’s relatively pretty rare and is valued due to its durability. The reason for creating the alloy Tungsten Carbide is to make Tungsten more workable. In its pure form molding and casting Tungsten proves to be too difficult for viability. Hence Tungsten Carbide becomes the ideal option for both industrial as well as jewelry making purposes. Chemically, Tungsten Carbide has equal parts of Tungsten and Carbon in the form of fine powder. This powder is then mixed with a binder to create the compound which we see in rings and other equipment like razor blades. The most commonly used binders in this process are Nickel and Cobalt. The new alloy that is created retains the fabulous properties of Tungsten. It is highly resistant to wear and tear with a high tensile strength and is only a tad bit heavier than 14 karat gold. Just like other metals Tungsten Carbide bands are good conductors of heat and electricity. Hence people working in close proximity to electricity or heat should take off the wedding band while they are working. Tungsten Carbide wedding rings can be combined with other metals like gold or with carbon fiber in black or blue colors to create fancy designs. This is why it has become a popular choice in bridal jewelry. Even years after your wedding, the bands will not scratch and shine like new. Another great property of Tungsten rings is that it is Hypoallergenic, a property which isn’t shared by even some of the most precious metals. Add that to the fact that precious metals like gold and silver are soft and can be bent or scratched easily, and we have a clear winner among wedding rings – Tungsten. Loosely translated in Swedish or Danish, Tungsten means ‘Heavy Stone’. The Swedish people also call it Wolfram as it was first mentioned by Peter Woulfe. Although knowledge about the naturally occurring element was present since the late eighteenth century, it was only during the twentieth century that we really began to realize the several potential uses of Tungsten. Tungsten Carbide was first used in the early twentieth century to make filaments which are used in light bulbs. Such a use is possible only due to its high melting point, toughness and resilience. Around the same time, the Germans also started manufacturing higher grade cutting tools using this alloy. These tools were often used for precision milling and for cutting of steel. During the Second World War, a large share of the weapons industry was based on Tungsten and its alloys due to its extreme strength. Only recently has the idea to make everlasting jewelry come into the market, thanks to the metals wonderful qualities of hardness and being hypoallergenic. What Are the Best Types Of Tungsten Rings? The best Tungsten Carbide jewelry is made using Nickel as a binder. While some people may be concerned about nickel due to allergies caused by it when used in gold alloys, it is not really a concern when used with Tungsten. Tungsten alloys use Nickel only in minute quantities and bind it together very closely with other atoms, thereby reducing the risk of allergies. However, one should keep in mind that the higher grade Tungsten rings have lower quantities of Nickel than low grade Tungsten rings which use it a little more freely. While cobalt is also used in Tungsten Carbide as an alloy, it is usually meant for industrial purposes and should be avoided in Tungsten rings. The reason behind this is that Cobalt undermines Tungsten’s Hypoallergenic properties, thereby leaving people open to risks of allergic reactions. The cobalt also reacts with oils produced by the skin, which can leave a stain on the ring. There are various kinds of tungsten wedding bands. These may include comfort fit bands, flat rings, channel set diamond studded Tungsten rings, brushed layer rings and tension set rings. Rings which are especially designed for women also come in variations of more contemporary bands which have a thinner width. When browsing for tension set rings, make sure you chose one that has a gemstone with a minimum of 9 rating on the Moh’s scale of hardness. This is due to the fact that softer or weaker stones may easily shatter when force fitted into a tension ring. The best choices of gemstones in such rings include sapphires, rubies, moissanite and of course diamonds. There are also two-tone Tungsten Carbide rings which use other metals to create beautiful designs and contrasting colors. You may often find people or online articles claiming that Tungsten rings are brittle and may break easily. These misconceptions are often fueled by competitors and are either misguided or exaggerated. In reality, Tungsten Carbide is more durable than most conventional metals used in jewelry, including gold, palladium, silver or platinum. They are resistant to scratching and never bend due to their brittle nature, but they do not break or shatter easily. 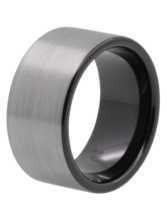 Good quality Tungsten Carbide rings will not shatter unless an extremely large amount of force is applied to the ring. In fact, metallurgical instruments often prefer Tungsten Carbide over even Titanium alloys due to their superior hardness. Only something as extreme as diamond cutting blade can cause damage to such instruments. Moreover, as discussed earlier, there is a clear safety benefit to the fact that Tungsten rings will break instead of bending in extreme situations. A bent ring can cause injury to the wearer and restrict blood flow, which cannot happen with a Tungsten ring. This makes them even more suitable for people who work around heavy machinery. Since Tungsten Carbide rings do not need to be removed during regular chores or office work, it is natural that over time they will get dirty and get coated with dirt, grime and oil. The surface of a Tungsten ring can be cleaned with a soft cloth dipped in a mild soap solution. Due to its high resilience and resistance to scratches, you can do such simple cleaning without having to worry about causing any damage to the ring. Of course, the ring can be just left on while you wash your hands or shampoo your hair and it will automatically get its daily cleaning. However, make sure you do not apply any undue pressure or use strong detergents, since Tungsten rings cannot be re-polished like rings made from traditional metals like Gold or Silver. Stains resulting from oil or lotion can be removed from the ring’s surface by using a soft cloth dipped with a little bit of alcohol. The alcohol mixes with the oil and uncovers your ring’s original shine. There are chances that sometimes you may notice a more concntrated stain on the ring which refuses to wash out even after repeated cleaning. It is advisable to contact your jeweler and ask for tips rather than resorting to more drastic measures like using a solution which may damage the ring’s polish. In most cases this stain, which can look like a scratch, is just a layer of some oxidized metal which came in contact with the ring. While Tungsten Carbide rings are mostly a safe bet when bought from a reliable source, irrespective of their type and design, there are a few things which a shopper might want to keep in mind when browsing for the perfect ring for themselves or their partner. Make sure your retailer offers you a considerable warranty. Since the Tungsten ring is supposed to last a life-time, it is prudent to get a confirmation of that. Some retailers even offer lifetime warranties that also describe their return policy in case you are not happy with the ring’s design, quality or sizing. While many retailers offer plated rings, it is better to go for something without a black plate. Jewelry grade Tungsten is made different from industrial grade Tungsten to make it ideal for your use. Hence, it is important to purchase it from a source which specializes in Tungsten jewelry and not just generic Tungsten. Buyers should try to avoid Tungsten Carbide rings which use Cobalt as a binder, especially those who are prone to allergies. In case the retailer cannot establish which binder is used, move on and look somewhere else. One of the most important things to keep in mind while buying a Tungsten ring is the size. You need to be completely sure about the size as Tungsten rings cannot be resized easily. Some experts recommend visiting the jeweler two times, in the later part of the day, with a couple of weeks in between so that you can have the right measurements of your finger taken. Whether you are a man looking for a ring for yourself or a woman looking for a wedding ring for your fiancé, there are certain things which need to be kept in mind while buying a ring for men. It is after all, a once in a life-time occasion and should be given its due consideration. A wedding ring is precious, not only because of its price tag but also because of its sentimental value. Why should you have to part with it and risk losing it by having to take it off regularly? Men who work in environments that can corrode of damage their wedding rings are especially suited for a Tungsten Carbide ring. The ring is less likely to be damaged by far and will retain its shine even after years of wear and tear. A man’s personality should match the kind of adjectives you would use to describe his ring. This is true not only for the ring’s color but also other attributes like the metals used in the ring, the gemstones set in it or even its thickness. Different colors of the ring or the gemstones are of course an important consideration when selecting the ring. Different men may prefer different styles. While some like it loud, bold and flashy, others might want to go for something more conservative or sober. Tungsten rings are great for the modern men who are born and brought up in the age of technology and innovation, especially if they are tech-savvy themselves. While this isn’t something which one may like to think of as a positive consideration, it is still one of the most important parameters that will decide what you purchase. Unfortunately, not everyone can afford a diamond ring. However, that doesn’t necessarily have to limit your options or leave you with something that you aren’t satisfied with. Tungsten rings come in such a large variety that there is always one for everyone. You can of course go for something a little easier on your current budget and then ‘upgrade’ the rings in a few years when you feel you can spend a little more. This will also give you more time to save for that perfect ring that you always wanted for yourself or the person whom you love the most. While each person’s ring should be a statement of their individuality, let’s not forget what these rings actually signify – the eternal union of two people. Hence, the bride and groom’s rings should go well together. While they do not need to be exact replicas or necessarily be purchased together as a set, they should at least have a few characteristics in common and bear some resemblance to one another. Characteristics which can be considered for a good match are the choice of metal, color of the band, intricacy, studded gemstone, width, engraving etc. While a marriage is something than transcends religious and cultural boundaries, it often has strong ties to both. Such religious and cultural beliefs hold different values to different people and should be taken into consideration when purchasing a ring for them. Engraving is a great idea in case you feel the need to personalize a ring as per your own beliefs. When purchasing Tungsten rings, this is a very important step as these rings cannot be resized easily once made. Since a wedding ring is something which you are going to be wearing for the rest of your lives, it becomes all the more important to have it in a size which is comfortable for you. Fortunately, any jeweler would be able to measure and give you your precise size.